Families receiving accommodation and support from the Gingerbread Centre will benefit from a year-long fundraising drive by the Catenian Association Circle in Stoke-on-Trent. Each year, the Catenian Association, a group of Catholic laymen, raise funds for charity. 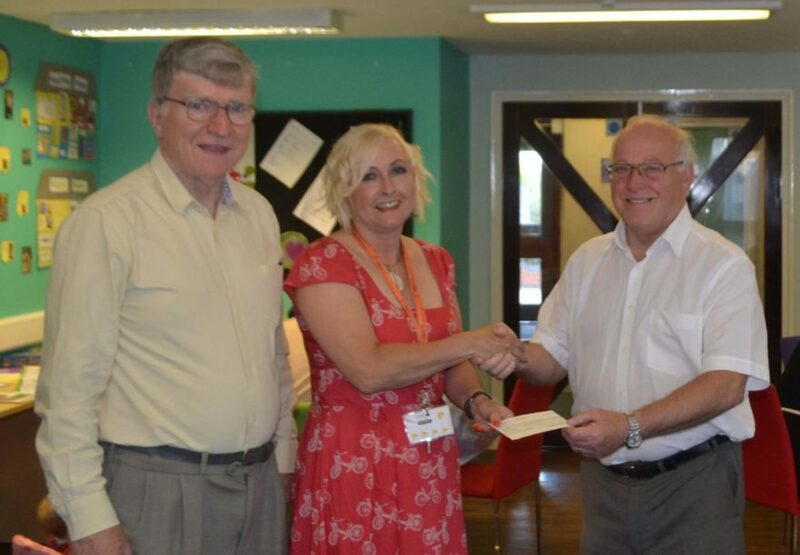 Two long-standing members, Peter Thorpe and Dr. Mervyn Ryan, are also Trustees at the Gingerbread Centre and they were on hand to present a cheque for £750 to Centre Chief Executive, Wendy Hocking. Peter, the 2017 President of the Stoke-on-Trent Catenian Circle, said: “I have been associated with the Gingerbread Centre for much of its 40 year history and it is, therefore, fabulous to be able to support them with a donation as the charity reaches a landmark anniversary. Peter and Mervyn presented the cheque and chatted to residents at Rothesay Court, Normacot, during an activity session. The Gingerbread Centre provides accommodation and support for homeless families at Rothesay Court and has a separate centre for homeless, pregnant 16-to-18-year-olds in the Hanley area.